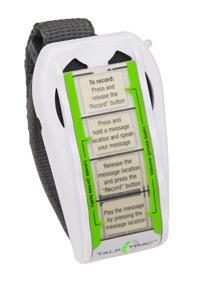 Communication on the go has never been easier with the TalkTrac wearable communicator. TalkTrac features four messages and two levels for a total of eight individual messages. It’s perfect for breaking the ice, conversing with family and friends, interacting with classmates, and even recording personal information and to-do lists. TalkTrac is a perfect companion for children and adults on the autism spectrum, helping them feel more comfortable in social situations.